Founded by Super Wang and SYSTEX Corp in 2001, Supergeo Technologies Inc. (Supergeo) is a leading global provider of geospatial software and solutions that make decision process easier and more efficient. 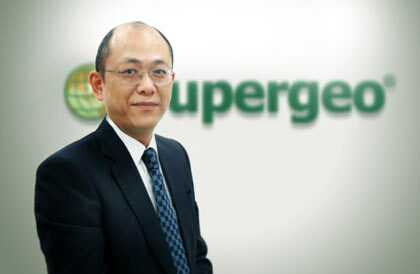 Headquartered in Taipei, Supergeo has constantly strived to improve state-of-the-art geospatial technologies and bring the customizable products and sustainable solutions to problems for geospatial-related applications. Its two research and development centers not only focus on advanced GIS technologies, but also carry out practical GIS applications for government institutes and enterprises. The product brand, SuperGIS® software has been spread over 100 countries as the backbone of the world’s mapping and spatial analysis, providing worldwide users with a wide range of geospatial information systems and services from Mobile, Desktop, Server GIS solutions and SDK resources. The company forecasts a 15% international growth for 2013 and higher growing rates in the next 5 years. Supergeo obtains the patent on the Internet map cache technology in 2009 (Patent name: Geographic Information System; No. 316671), which enables users to save the viewed section of geographic images in the save extension. In addition, the SuperGIS® solutions support OGC standards with the software release. Its server GIS solutions offer high compatibility with enterprise database such as MDB, MS SQL Server, PostgreSQL Server, and Oracle Spatial, as well as performing patent classification and cache tools with AJAX technology to improve interactivity, speed and usability of websites. Innovation, professional, and especially Integrity are Supergeo’s fundamental core values. Not only profession and innovation are the assets to Supergeo’s business growth, Integrity helps the company establish excellent rapport with clients, and make the business long-lived. The company devotes itself completely to fulfilling each commitment when making a promise. Leveraging GIS technology into our daily life changes the way we see, understand, and interact with the earth. The use range of GIS covers from scientific applications, such as climate change monitoring or marine conservation, to personal recreation uses, like route planning for trips. SuperGIS® technologies have brought a safer and more intelligent life and made the world more sustainable through effective management. The SuperGIS® solutions were adopted by domestic and international government departments, education institutes, and private enterprises for specific goal with streamlined operation. As emerging market economies have grown, it generates potential business opportunities globally. To follow recent trend toward developing value-added software and customizable applications, Supergeo continues the software enhancement and workforce development in order to respond to the challenges of data processing and management and identify unmet needs in these emerging markets. For the coming years, cost-effective GIS hardware or software produced by young providers will be employed widely to assist clients in satisfying their mapping applications and further encouraging the uses of GIS technology in day-to-day navigation. Supergeo will surely keep promoting an affordable, reliable, and highly capable alternative GIS solution for meeting the regulatory needs of an evolving industry. In the global GIS market, Supergeo works in collaboration with worldwide resellers, from Asia Pacific, Middle East, Europe, Africa, America, to Oceania and the size of its global reseller network is steadily increasing. The company also engages in developing Mobile applications for iOS/Android phones due to the popularity of mobile computing devices, to extend GIS application and perform data creation on the mobile in the field. Last but not least, the 3D advancement for creating 3D displays would be aimed, to bring a more realistic display and analysis environment for clients in the world. Supergeo will soon release a freely-rotatable 3D model of the earth, enabling users to turn 2D GIS into 3D GIS and perform advanced analysis visualization for better decision making and operational planning.